Sometimes when I am in a hurry to make dinner, the health factor just goes out the window. I scramble to have something on the table so that my kids and hubby don’t starve. Not thinking that the calories we are about to consume means we shouldn’t be eating for the rest of the week. This recipe answers both speed and health! I never had an affinity for sweet potatoes, but for some reason after having babies, my taste buds have changed. I am loving sweet potatoes! 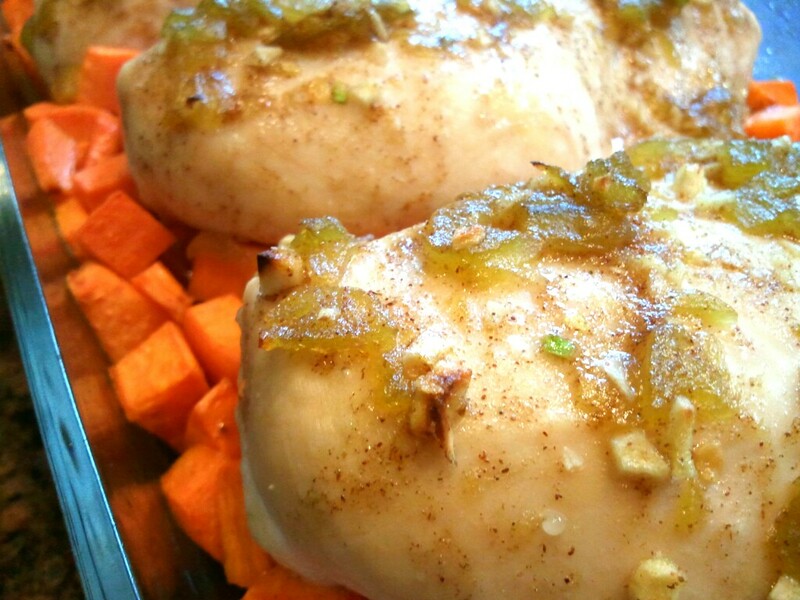 The sweet potatoes and chicken in this dish will have you tasting earthy, savory, rich flavors without consuming a thousand calories. In a medium bowl, place diced sweet potatoes. In a small mixing bowl combine 2 Tablespoons olive oil, chiles, garlic, honey, vinegar, salt, cumin, and cinnamon. In a separate small mixing bowl combine 1 Tablespoon of olive oil and 2 teaspoon of the chile/honey mixture. Toss in with sweet potatoes until covered. Scatter the potatoes on the bottom of a roasting pan and bake for 15 minutes. Take potatoes out of oven and stir. Then place chicken breasts on top of potatoes and smother the remaining honey/garlic mixture on chicken. Cook for another 20 minutes, or until chicken is done.